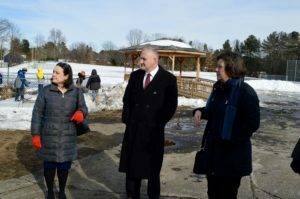 On a recent January day, we were honored to bring together a group of newly elected Massachusetts State legislators, Northampton Public School leaders and those working directly on Farm to School initiatives for a close look at these programs at RK Finn Ryan Road School. Special guests MA Senator Jo Comerford and MA Rep. Lindsay Sabadosa were joined by Northampton Superintendent John Provost, Principal Sarah Madden, Food Service Director Mistelle Hannah and representatives from the Northampton School Committee, School Sprouts, Mass Farm to School and Grow Food Northampton. 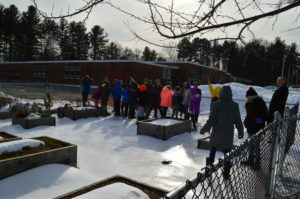 Despite the chill in the air and the ice on the ground, the group was happy to meet around the school garden for a short presentation by the fourth grade. As the students gave an overview of the garden, you could hear their excitement. They explained their Three Sisters Garden and the Native American history of this planting technique. All Northampton elementary schools also have school gardens that are integrated into the curriculum in grades K-6. Superintendent John Provost observes Apple Veggie Wrap making. Principal Sarah Madden led a round of introductions before continuing the tour inside. 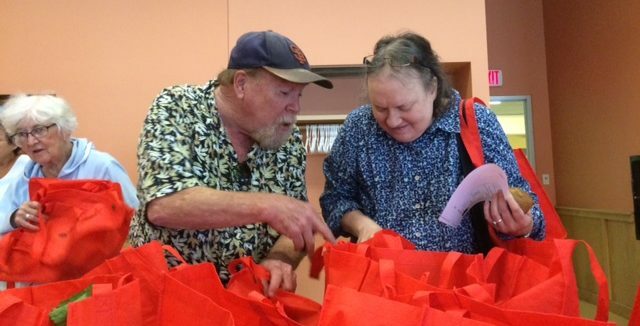 This school year has seen a deeper connection and commitment to local food. Our Grow Food Kids program in Northampton elementary schools is now reaching every K-3 student in the district through in-class workshops and field trips. Principal Madden brought the group through the colorfully decorated halls to Ms. Ramsden’s first grade class where a Grow Food Kids workshop was taking place. 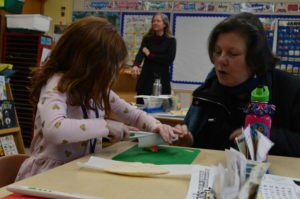 Local Food Educator, Ellena Baum had just finished up a fun winter tree identification lesson and game and the class was washing their hands before preparing Apple Veggie Wraps. Conversation filled the room as kids talked about their techniques for cutting and rolling their wraps, sharing their skills with the adult visitors. The last stop on the tour was a visit to the school cafeteria. 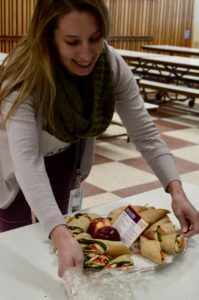 Mistelle Hannah, Food Service Director, has implemented plans to highlight local food in the school cafeterias since her arrival in August. 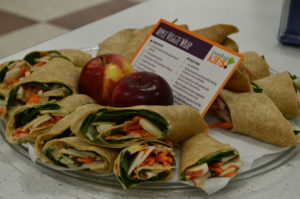 Mistelle greeted everyone with a platter of Apple Veggie Wraps, the same recipe from the workshop, which had been served at lunch that day in the cafeteria as part of the Mass Farm to School “Harvest of the Month” program. This is another clear example of that deeper connection to local food in Northampton schools. A lively conversation rounded out the visit with topics spanning local food in the school cafeteria and how to afford it, dreams for expanding Farm to School education into the middle and high schools and anecdotes and successes from the programs. 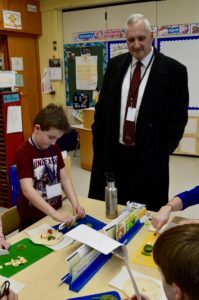 Program leaders expressed gratitude for past funding, including state funding sought by Reps. Peter Kocot and John Scibak through the Department of Elementary and Secondary Education budget, and the need for more to be able to continue to grow. 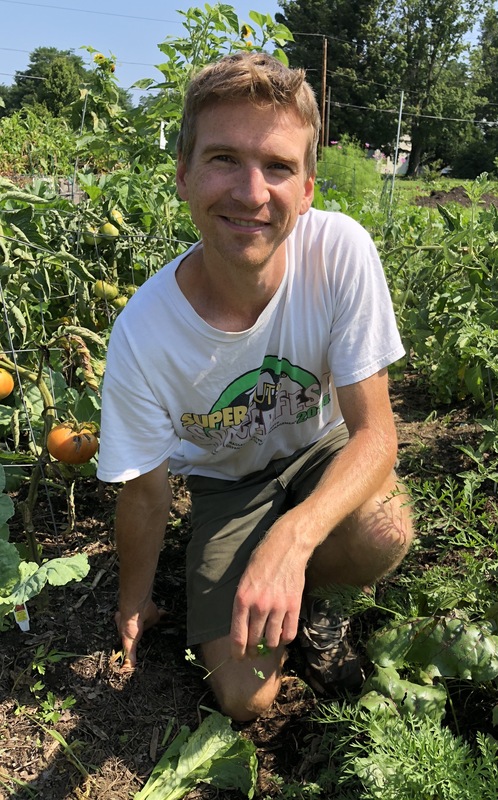 We’re grateful to all who participated, and to the hundreds of Northampton families whose children we are fortunate to work with as they become experts on growing, preparing, and eating foods that are healthy and local! Rep. Lindsay Sabadosa talking cutting techniques. Sen. Jo Comerford talks to a first grader.